This March, join us for RENEWAL 2019! 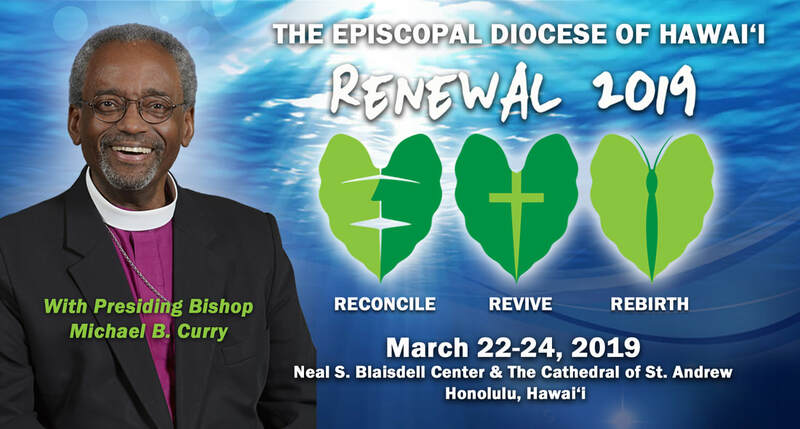 The Episcopal Diocese of Hawai'i will be hosting a weekend of spiritual renewal, worship and fellowship, beginning Friday, March 22 to Sunday, March 24, 2019. We are thrilled and delighted to have the Most Rev. Michael Bruce Curry, Presiding Bishop and Primate of the Episcopal Church, with us for this special event, and to meet the people of the Diocese. We are also excited to have the Rev. Jay Sidebotham, the Director for RenewalWorks, and an impressive line-up of guest speakers to take part in Friday's Education Day and Panel Discussion on Saturday. Click HERE to view information on our guest speakers, breakout sessions and panelists. ​Renewal 2019 is open to all, but space is limited, and we expect all events to fill up quickly. Below is a brief description of the activities taking place each day with links to more detailed information and registration. Friday and Saturday's events will be taking place at the Neal S. Blaisdell Center, and Sunday's worship and Talk Story Interview will be held at the Cathedral of Saint Andrew. The Sunday Eucharist and Talk Story Interview will be live-streamed, and churches are encouraged to set up group viewings. Limited scholarships are being made available for those that are unable to afford the cost to attend. Child care is being offered on Friday and Saturday and can be arranged through the registration links for each day. Morning Plenary Session with Kahu Kalani Souza - Among his many gifts, Kahu Kalani Souza is a Hawaiian Practitioner and Cultural Facilitator, who has promoted social justice through conflict resolution. He has worked on numerous task forces and groups dealing with indigenous issues, and helped implement programs that integrate traditional practices and knowledge for some of our most pressing cultural and environmental challenges. Morning and Afternoon Breakout Sessions - Participants are invited to attend a workshop in each of the breakout sessions, choosing from a variety of topics including: RenewalWorks with the Rev. Jay Sidebotham; Ho'oponopono (Healing) with Dr. Manulani Aluli Meyer; It Ain't Easy Being Native: Indigenous People, Christianity and the Episcopal Church with the Rev. Dr. Bradley S. Hauff; Diversity, Inclusion and Reconciliation with Jim Penny, Managing Conflict with Kahu Kalani Souza, Understanding the Psycho-Social Dynamics of Communication with Ricky Melchor. Learn more about each of our guest speakers and their presentations HERE. Afternoon Book Signing and Fellowship - Meet our Presiding Bishop who will be available for book signing and pictures! There will be entertainment and refreshments (non-alcoholic beverages). Be sure to bring your book for him to sign! Presiding Bishop Michael Curry's books are widely available online through Amazon and most retail bookstores. His latest, The Power of Love, was released in 2018. Hawaiian Dinner Buffet - The Right Rev. Robert Fitzpatrick offers a prayer and the official welcome to our Presiding Bishop, followed by a Hawaiian dinner buffet. Vegetarian options will be available. Morning Plenary Session with The Rev. Jay Sidebotham - As Director of RenewalWorks, the multi-faceted and multi-talented Sidebotham will talk about "What We're Learning About the Episcopal Church Through RenewalWorks: Spiritual Growth Opportunities for Reconciliation." RenewalWorks is a catalyst for refocusing parishes (and the individuals in them) on spiritual vitality. It has been tailored to the Episcopal tradition, adapting 10 years of research that has uncovered key characteristics of flourishing congregations. It will inspire your congregation and leadership to rediscover who Jesus is, and what it means to follow him. Afternoon Panel Discussion on Reconciliation - The Most Rev. Michael Curry, The Right Rev. Robert Fitzpatrick and others will address the topic of reconciliation as part of our panel discussion. Opportunity for questions and answers will be provided at the end of this session. 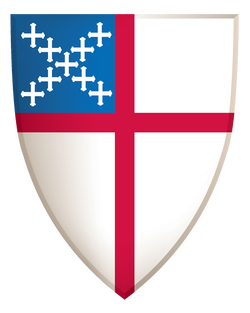 Sunday morning worship will take place in the Cathedral of Saint Andrew, with Presiding Bishop Michael Curry delivering the sermon. Light refreshments will be served under the Cathedral's Aloha tent immediately following the service. In the late afternoon, special guest Barbara J. Tanabe will conduct a Talk Story Interview with the Presiding Bishop in the Cathedral, graciously supported by the Margaret "Peggy" Kai Memorial Lecture Series. The interview will be followed by a public book signing and photo ops with the Presiding Bishop. Overflow and live-streaming of both the service and Talk Story Interview will be available in Tenney Theatre. The live-stream link will also be available on the Diocesan website for all to view. Churches are encouraged to plan group viewings of the Talk Story interview and to consider coordinating Sunday services to follow along with the live-stream. There is no fee and no registration required to attend Sunday's events, but to give us an idea of how many people to prepare for, please RSVP through the link below. The planning committee for this conference would like to gratefully acknowledge the participation and helpful ideas contributed by the late Reverend Canon Malcolm Nāea Chun to our planning process.